4GoodHosting supplies over 300 website application scripts at no additional charge, and all come standard with all our hosting plans. No need for a programmer, as the provided softaculous 1-click auto-installer is easy to use. Each application has full administration instructions and we also have example videos in our knowledge-base, but if you do need help we will solve it for you via our support department. Click below to order now. b2evolution is a classy news weblog tool , i-e software allowing you to run newsfeeds and weblogs. It's free with all business web hosting accounts as well get a free domain name. It runs on your own domain website that is hosted with us. 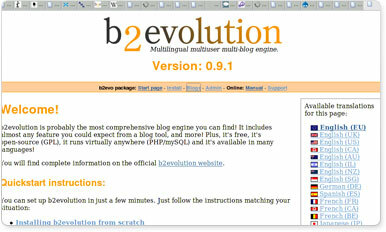 As you will find out, b2evolution also includes a lot more features than the average blog tool. 4GoodHosting.com | R629 Enterprises Ltd. Copyright © 2019 4GoodHosting All Rights Reserved.